High profile Gold Coast event infrastructure and engineering company iEDM has won the maiden Student Employability Award as part of the prestigious Gold Coast Business Excellence Awards. 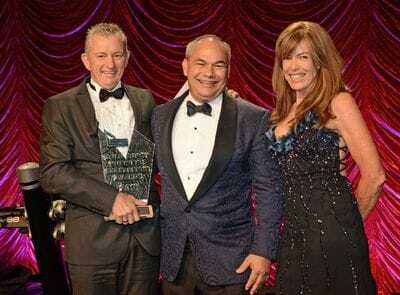 The Southport-based iEDM, which has been involved with designing and installing infrastructure for large scale events around the world, was named the first ever winner of the award at a ceremony held at City of Gold Coast chambers. The Gold Coast Business Excellence Awards have been operating on the Gold Coast for 23 years and some of the city's best-known companies can claim to being winners. The new Student Employability Award, which is sponsored by Study Gold Coast, is designed to reward companies who employ students from local educational institutions. In announcing iEDM's win, Gold Coast Business Excellence Awards' president Ian Cousins said the company, which now has 40 employees, prided itself on employing students. "They have consistently employed one to two interns per year and created internship programs based on the organisational needs and the capabilities of the incoming students,'' said Mr Cousins. The winners in the other categories for May were Mi Electric (The Mayor's Innovation GC Award), Petway Petcare (The Family Business Award), Paradise First Aid (The Health and Wellbeing Award), Protest Engineering (Professions and Business Services), SAE Group (Retail, Wholesale and Distribution), Skyline Landscape Services (Construction and Trades), PT Automation Solutions (Manufacturing Award), BITS Technology Group (IT and Digital Business), Wyndham Cruises (Tourism, Hospitality and Events) and The Institute of Makeup (Emerging Business). The awards' major sponsors include Ramsden Lawyers, Study Gold Coast, City of Gold Coast, Regional Development Australia Gold Coast, Choice Homes, Westpac, Harvey Norman Commercial Queensland, Optus Business Centre Gold Coast, Griffith University, Gold Coast Airport, Pindara Private Hospital and The Southport Private Hospital and Flight Centre Business Travel. The awards' media sponsors include the Gold Coast Bulletin, Nine NBN Television, 92.5 Gold FM and 90.9 Sea FM.